There are lots of options available in the personal finance/financial literacy field. While each book provides great information and a unique approach to delivering content, Lance Palmer and I kept running into the same problem: students were not reading the material. This became a problem because we ended up spending so much class time getting students up to speed that we missed opportunities for real engagement. Sound familiar? We felt like the books were missing the mark in terms of building financial literacy and financial capacity. This is the reason we decided to rethink the way personal finance education is being delivered. 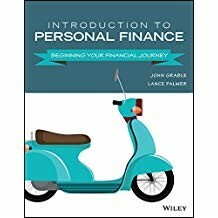 This book presents personal finance material in the framework of a lifetime journey (thus the graphic on the book cover). Rather than force students to read through 16 to 18 densely written chapters, our approach is totally modular. This means that instructors can choose what they want students to read and in what order material is covered. Additionally, the topics (which are grouped by chapter) are short, engaging, and fun. Based on student feedback, this is what we have learned. First, students are finally reading the material! Why? Because the topics fit the lifestyle of 21st century learners. Second, students are using the built in assessments prior to class. This makes class discussions more engaging and fun. Third, students appreciate that the “math” element of the class is focused on practical applications rather than on developing skills to become a financial analyst. Finally, instructors love the idea that they can choose topics to include or exclude from the class with very little disruption to the overall flow of the content delivery for students. It’s easy and simple! For example, one of our colleagues really likes discussing human capital, risk tolerance, and other “interior finance” topics. The course allows him to make these topics visible to students. Another colleague prefers to focus on investment topics so she hides some of the softer topics from student view and allows them to access all of the investment topics. If you are looking for content that was developed specifically to make personal finance fun and engaging, this book is for you. The purpose of this book is to provide financial planners insights into improving their communication and counseling skills. The approach presented in the book is based on helping financial planners develop, practice, and use skills associated with the formal and informal sharing of information between a client and the financial planning professional in an empathic manner that enhances the client-financial planner relationship. This book was written to be a useful resource for both professionals and students who work with clients on a day-to-day basis. The Certified Financial Planner Board of Standards, Inc. (CFP Board)—the primary academic standards setting and enforcement board for college and university programs[i]—has identified communication and counseling skills as an essential element of financial planning competency. 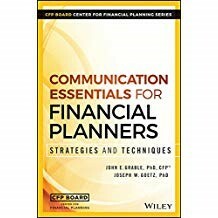 Some have even argued that “Effective communication is vital to successful financial planning.”[ii] The content of this book, along with the video examples, can help improve a financial planner’s proficiency (a) when evaluating client and planner attitudes, values, biases, and behavioral characteristics and the impact these have on financial planning; (b) in communicating with clients; and (c) with counseling skills. A remarkable online platform that allows students to focus on learning by organizing their study with a daily task list, reminders, and performance metrics. Feedback from students has been exceptional, with a great response to both the quality of the course and the value for money in comparison to the competition. 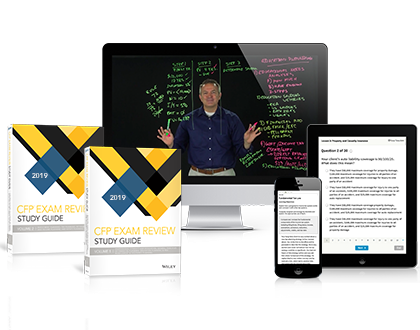 Along with a 2-volume Study Guide set, it also includes a full-length mock exam, a 500+ question test bank, more than 1400 online flashcards and 15+ hours of video lectures and so much more. Go ahead and take a look for yourself. The Case Approach to Financial Planning: Bridging the Gap between Theory and Practice, Fourth Edition, fosters sound financial planning logic and decision-making using the CFP Board of Standards, Inc. newly-revised 7-step systematic financial planning process. This textbook provides the tools and foundation for helping aspiring financial planners learn by doing. The material in this book provides students with real-world scenarios that can provide insights into the financial planning process as they put their financial planning skills to the test. A variety of 16 case studies, including an ethics review case. A step-by-step guide to the preparation of a comprehensive personal financial plan. Instructions on how to do calculations essential to creating a financial plan. 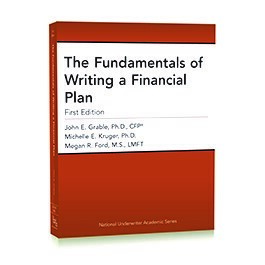 Fundamentals of Writing a Financial Plan provides a new and unique approach to helping aspiring financial planners write a comprehensive financial plan. The book shows how the CFP Board of Standards, Inc. newly-revised 7-step systematic financial planning process can be applied when writing a comprehensive financial plan for an individual or family. Chapter-based learning aids, including access to a fully integrated Financial Planning Analysis Excel™ package and other online support materials, including video examples of client communication strategies. The personal, household, and consumer finance field is growing quite rapidly, especially as universities and policy makers see the need for additional research and clinical application in this dynamic area of study. Currently, the profession is advancing towards the stage where professional practice becomes increasingly evidenced-based. 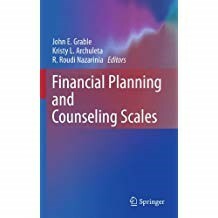 Financial Planning and Counseling Scales provides educators, researchers, students, and practitioners with a much needed review of reliable and valid personal assessment scales and instruments that can be used for both research and clinical practice. In addition to presenting actual scales and instruments with applicable psychometric details, the book also includes an overview of measurement issues and psychometric evaluation. This entry was posted in Consumer News on January 25, 2019 by FP Performance Lab Staff. ← A Market Correction in 2019? A Market Correction in 2019?